My mum taught me how to make these. I think the original recipe that she used was from an Australian Women’s Weekly Cookbook and I have tweaked it slightly by adding chutney. This is one of the meals that reminds me of winter Sunday evenings as a child! I now will often make them just for the purpose of the kids’ school lunch boxes as they are very happy to eat them cold. It becomes my own little production line. They smell fabulous while they are cooking too! Preheat oven to 200 degrees Celsius. 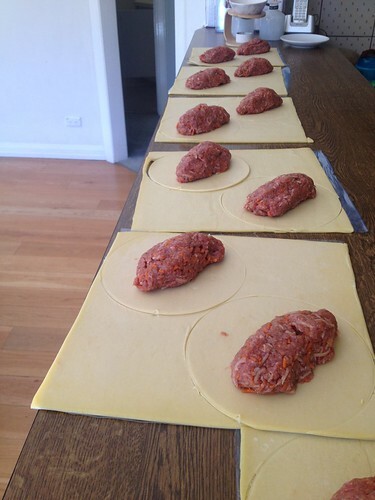 Lay pastry sheets out to thaw. Peel and grate potatoes, carrots and onions into a large bowl. To drain excess moisture from this mixture, pour it out onto a clean tea towel and then wring tightly until liquid no longer escapes. Add mince, tomato sauce, chutney and Worcestershire sauce, mixing thoroughly. 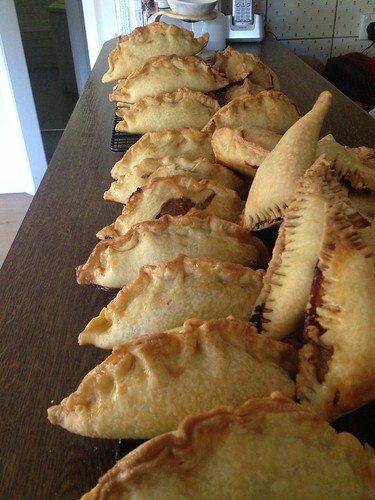 I like to make the pasties look like cornish pasties, so use a bread and butter plate to cut a circle in the pastry. Heap the meat mixture into the middle of the pastry circle and bring up the edges of the pastry and twirl the edges to seal. Brush the middle join with egg and sit on a lined tray. 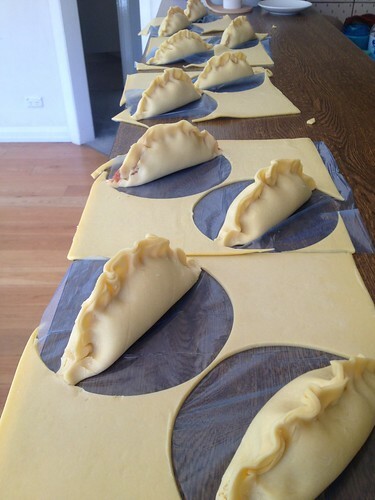 Continue to make pasties until pastry and mixture has been used up. Towards the end of making the pasties, to minimise waste of pastry, I make some small, funny shaped pasties for the younger children. Place in the oven and cook for 10 minutes. Reduce the temperature to 180 degrees Celsius and cook for a further 20 minutes or until the pasties have turned golden. Serve with a side dollop of chutney! Want to make the lunch box process easier? In my online course called Meal Prep PrimerI show how you can easily make some easy item for the kids’ lunch boxes that will help make the lunch box process so much easier! Meal Prep Primer shows you how to effectively plan your time in the kitchen over the weekend, and prep food that will make your week days easier. To keep on top of feeding the family, many years ago I started spending some time on the weekend, prepping food for the week ahead. Even if it is was just one or two things for the kids’ lunch boxes, the difference this made during the week was huge. We use the U Konserve 350ml stainless steel thermos when wanting to have soup or use up left overs. 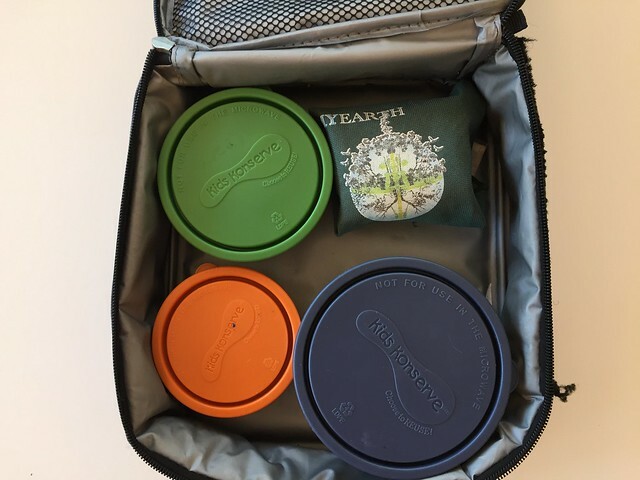 biome ecostores have a huge range of lunch box and lunch box items on sale at the moment, including many of the items I have reviewed above, which is worth checking out if you need new lunch box items. Some of the links contain affiliate links, which means at no extra cost to you, making purchases through them helps support this site. Thank you!